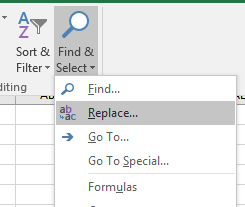 When using the CTRL+H keyboard shortcut or the Replace button on the ribbon, the Find and Replace dialog box displays the Find tab instead of the Replace tab. This issue impacts Version 1708 (Build 8420.xxxx). This issue is now fixed in Monthly Version 1708 (8431.2094). To get the latest update immediately, open any Office 2016 app and choose File > Account > Update Options > Update Now.